If your chimney has a corbeled smoke chamber that needs to be repaired or replaced, one option is a cast-in-place smoke chamber restoration. This type of restoration is typically done at the same time as a flue relining, allowing for a seamless transition from smoke chamber to flue. At Olde Towne Chimney, we recommend the Guardian SCR smoke chamber restoration. This is one of the best products on the market today and will leave you with a smoke chamber that will last for years to come. Cast-in-place smoke chamber restoration is unique in that it can completely smooth over any corbels in your smoke chamber. This creates an easier transition for smoke and other byproducts of combustion as they travel through the smoke chamber and up the flue. The smooth cone shape created by cast-in-place restoration is the ideal configuration for the smoke chamber. Having this type of restoration done not only makes your fireplace safer, but can also dramatically improve fireplace efficiency. The Guardian SCR cast-in-place smoke chamber restoration is one of the most unique products on the market today. Not only does it create an impenetrable thermal barrier with only one inch of thickness, but it has also been shown to dramatically increase the structural integrity of the smoke chamber itself. This makes the Guardian SCR product ideal for homes with an older fireplace or other structural fireplace issues. In addition to preventing heat transfer and strengthening the integrity of your smoke chamber, the Guardian SCR has been tested and certified by Underwriters Laboratory at one inch thickness. Because of this, installing this cast-in-place liner in your smoke chamber will bring your fireplace up to the modern building codes. 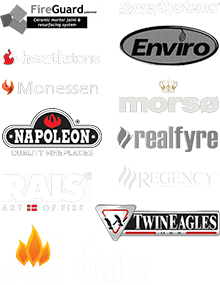 Having a fireplace that is up to code protects you and your family against accidental house fires, but also makes sure your homeowners insurance will cover you in the extremely unlikely event of an accident. Have Your Smoke Chamber Parged Today!  If your home’s smoke chamber does not meet current building standards, don’t delay – call Olde Towne Chimney today at 812-284-0123 to learn how cast-in -place restoration can improve your fireplace’s safety and performance! A spray-on system like Smoketite is another option for smoke chamber restoration and repair. We can tell you more about it when you contact us for an appointment.